Black Angus Steakhouse opened in 1964 in the then-emerging Kingsway neighbourhood, in west-end Toronto. An intimate, 70-seat space, the original restaurant featured open hardwood and charcoal grills, which quickly became its signature. The restaurant was also instrumental in introducing Toronto to Certified Angus Beef. 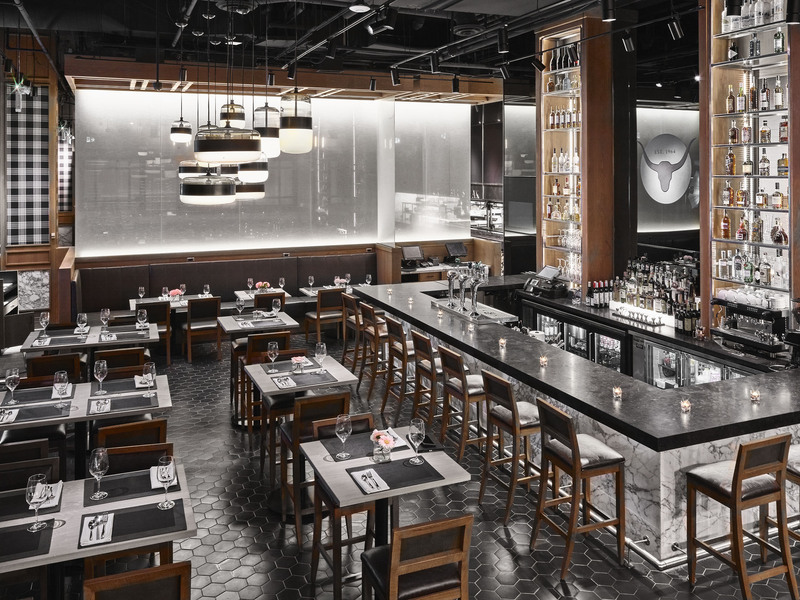 In 2012, new owners took over and undertook a small renovation that preserved the original steakhouse’s formality, but could not overcome the room’s space limitations. 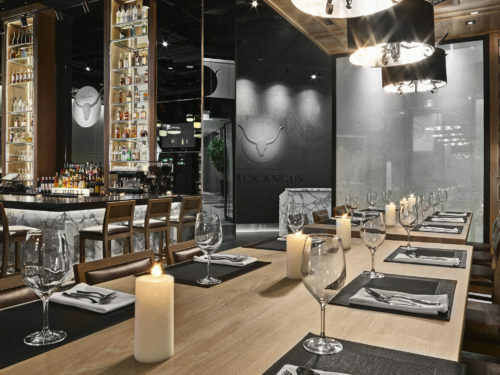 In 2016, following a fire that destroyed the restaurant, the ownership decided to rebrand and relocate Black Angus to a much larger space a few blocks west, on the ground floor of an office building at the northeast corner of Bloor St. W. and Islington Ave. The reinvented Black Angus opened in mid-2018. Eclectic, globally focused menu offers steak, seafood, pasta and vegetable dishes in a contemporary steakhouse ambience. Black Angus has significantly broadened its menu. There are the restaurant’s signature steaks (including wagyu beef from Snake River Farms, in Idaho) and classics such as the Original 1964 BBQ Back Ribs. But the updated menu also features creative seafood and pastas, and vegetable options such as a grilled cauliflower main course. New to Black Angus is a lunch menu offering the likes of grilled merguez sausage, a burger, main-course sandwiches and wraps, pastas, catch of the day — and, of course, steaks. Dinner — Hot and smokey grilled seafood tower; butternut squash ravioli; grilled chicken supreme stuffed with smoked gruyere cheese. Lunch — Ember roasted beets; grilled miso marinated Arctic char; roast porchetta panini with chimichurri. Greg Argent. “We want to maintain the identity and reputation of Black Angus to the people who know and love it, and also build on that, in a much larger space, to attract a new clientele,” said Argent, who brings with him an impressive pedigree earned at top-shelf Toronto kitchens such as Rain, Cru and Forte. The ownership team envisioned an accessible space that appealed to a more diverse demographic. So they enlisted Divia La Penna, principal and senior designer of Toronto-based Divia La Penna DesignStudio, to create a thoroughly modern look, but still reflect the history and standards of the original restaurant. Gone is the traditional dark, windowless, wood-paneled steakhouse that appeals primarily to males. In its place is a sleek and contemporary 6,000-square-foot, high-ceilinged space. 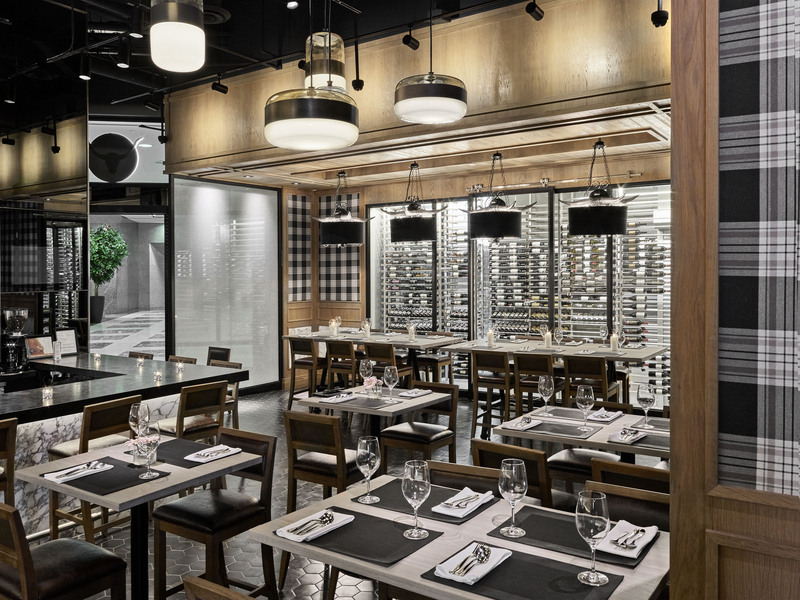 Identifying a void in the local market for a buzzy, downtown-style bar and restaurant, the owners branded the concept ‘Grill • Bar • Steak.’ La Penna achieved those goals by designing a series of stylishly outfitted spaces. The objective was to open up the restaurant, bringing in plenty of natural light via floor-to-ceiling picture windows, to cultivate a livelier vibe. Fostering a contemporary look are up-to-the-minute design features such as stainless steel; warm, natural white oak; a palette of charcoal grey; glass and steel light fixtures; and walls accented by dolomite stone. 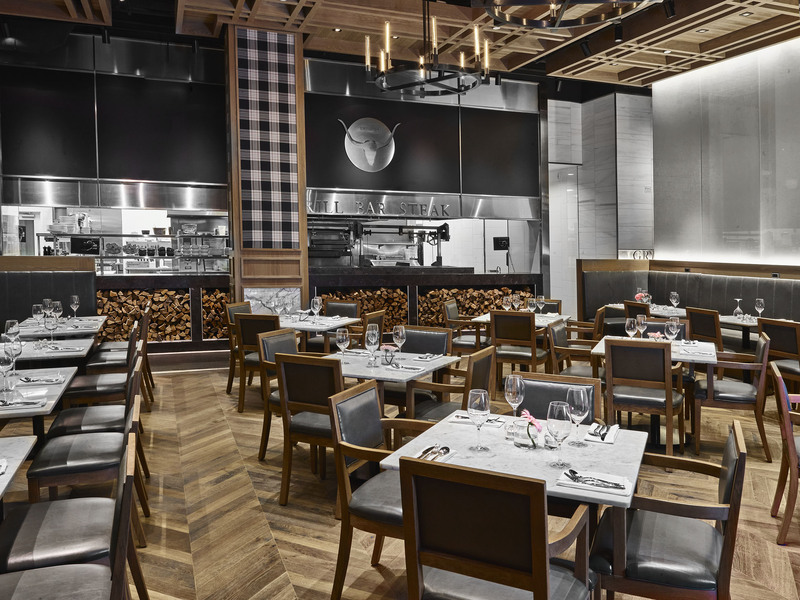 A signature of the original Black Angus, open wood and charcoal burning grills are now an even bigger focal point — there are three grills, one each dedicated to beef, fish and vegetables. Augmenting the grills is a fully open kitchen. New to Black Angus, however, is a private dining room that can host corporate groups. In addition, fully one-third of the restaurant is devoted to a more casual dining and bar area, suitable for lunches and drinks. Perhaps no area of the restaurant embodies the owners’ modernize-but-respect-our-past vision like the intimate, communal seating alcove. There, a fully glazed cellar showcases the wine list’s 2,000 bottles. Adding visual flair is a suspended white oak ceiling. Brought over from the original restaurant, metal bullhorn light fixtures were cleaned up, rewired, painted and sheathed in eye-catching, black satin shades. A private room seats 32 people and can accommodate 50 for standing, cocktail-style events. On weekend afternoons, the restaurant is available for buyouts and accommodates 160, seated and 200, cocktail-style.